[imf,residual] = emd(X) returns intrinsic mode functions imf and residual signal residual corresponding to the empirical mode decomposition of X. Use emd to decompose and simplify complicated signals into a finite number of intrinsic mode functions required to perform Hilbert-spectral analysis. [imf,residual,info] = emd(X) returns additional information info on IMFs and residual signal for diagnostic purposes. [___] = emd(___,Name,Value) estimates emd with additional options specified by one or more Name,Value pair arguments. emd(___) plots the original signal, IMFs, and residual signal as subplots in the same figure. For this example, consider a nonstationary continuous signal composed of sinusoidal waves with a distinct change in frequency. The vibration of a jackhammer and the sound of fireworks are examples of nonstationary continuous signals. Load the nonstationary signal data with the sampling frequency fs, and visualize the mixed sinusoidal signal. The mixed signal contains sinusoidal waves with different amplitude and frequency values. To create the Hilbert spectrum plot, you need the intrinsic mode functions (IMFs) of the signal. 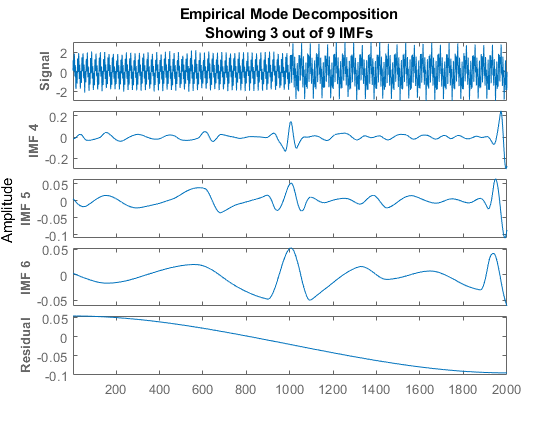 Perform empirical mode decomposition to compute the IMFs and residuals of the signal. Since the signal is not smooth, specify 'pchip' as the Interpolation method. The table generated in the command window indicates the number of sift iterations, the relative tolerance, and the sift stop criterion for each generated IMF. This information is also contained in info. You can hide the table by adding the 'Display',0 name value pair. 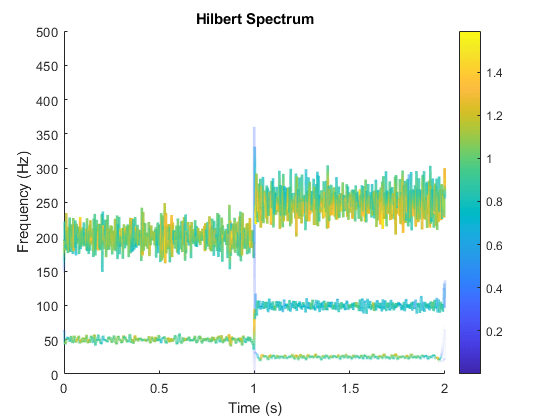 Create the Hilbert spectrum plot using the imf components obtained using empirical mode decomposition. The frequency versus time plot is a sparse plot with a vertical color bar indicating the instantaneous energy at each point in the IMF. The plot represents the instantaneous frequency spectrum of each component decomposed from the original mixed signal.Three IMFs appear in the plot with a distinct change in frequency at 1 second. For this example, consider a nonstationary continuous signal composed of sinusoidal waves with a distinct change in frequency. The vibration of a jackhammer, or the sound of fireworks are examples of nonstationary continuous signals. 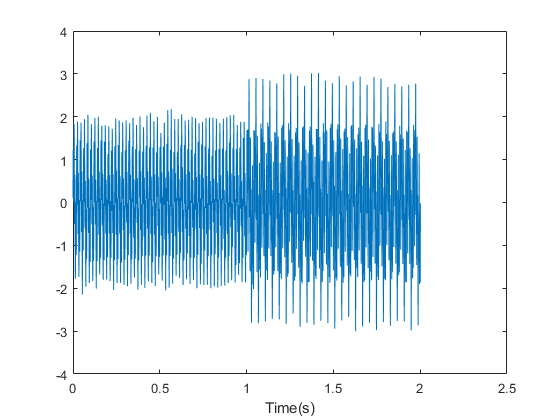 Load the nonstationary signal data, and visualize the mixed sinusoidal signal. Observe that the mixed signal contains sinusoidal waves with different amplitude and frequency values. Perform empirical mode decomposition to plot the intrinsic mode functions and residual of the signal. Since the signal is not smooth, specify 'pchip' as the Interpolation method. An interactive plot with the original signal, the first 3 IMFs, and the residual is generated. The table generated in the command window indicates the number of sift iterations, the relative tolerance, and the sift stop criterion for each generated IMF. You can hide the table by specifying Display as 0. Right-click on the white space in the plot to open the IMF selector window. 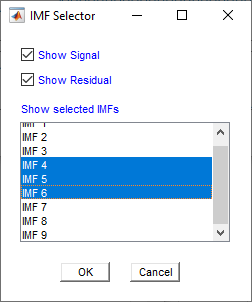 Use IMF selector to selectively view the generated IMFs, the original signal, and the residual. Select the IMFs to be displayed from the list. Choose whether to display the original signal and residual on the plot. The selected IMFs are now displayed on the plot. Use the plot to visualize individual components decomposed from the original signal along with the residual. Note that the residual is computed for the total number of IMFs, and does not change based on the IMFs selected in the IMF selector window. Uniformly sampled time-domain signal, specified as either a vector or single data column timetable. Cauchy type convergence criterion, specified as the comma-separated pair consisting of 'SiftRelativeTolerance' and a positive scalar. SiftRelativeTolerance is one of the sifting stop criteria, that is, sifting stops when current relative tolerance is less than SiftRelativeTolerance. Maximum number of sifting iterations, specified as the comma-separated pair consisting of 'SiftMaxIterations' and a positive scalar integer. SiftMaxIterations is one of the sifting stop criteria, that is, sifting stops when the current number of iterations is larger than SiftMaxIterations. SiftMaxIterations can be specified using only positive whole numbers. Maximum number of IMFs extracted, specified as the comma-separated pair consisting of 'MaxNumIMF' and a positive scalar integer. MaxNumIMF is one of the decomposition stop criteria, that is, decomposition stops when number of IMFs generated is equal to MaxNumIMF. MaxNumIMF can be specified using only positive whole numbers. Maximum number of extrema in the residual signal, specified as the comma-separated pair consisting of 'MaxNumExtrema' and a positive scalar integer. MaxNumExtrema is one of the decomposition stop criteria, that is, decomposition stops when number of extrema is less than MaxNumExtrema. MaxNumExtrema can be specified using only positive whole numbers. Signal to residual energy ratio, specified as the comma-separated pair consisting of 'MaxEnergyRatio' and a scalar. MaxEnergyRatio is the ratio of the energy of the signal at the beginning of sifting and the average envelope energy. MaxEnergyRatio is one of the decomposition stop criteria, that is, decomposition stops when current energy ratio is larger than MaxEnergyRatio. Interpolation method for envelope construction, specified as the comma-separated pair consisting of 'Interpolation' and either 'spline' or 'pchip'. 'spline' interpolation method uses cubic spline, while 'pchip' uses piecewise cubic Hermite interpolating polynomial method. Toggle information display in the command window, specified as the comma-separated pair consisting of 'Display' and either 1 or 0. The table generated in the command window indicates the number of sift iterations, the relative tolerance, and the sift stop criterion for each generated IMF. Specify Display as 1 to show the table or 0 to hide the table. Intrinsic mode function, returned as a matrix or timetable. imf is any function whose envelope is symmetric with respect to zero and whose numbers of extrema and zero crossings differ by at most one. Use imf to apply Hilbert-Huang transform to perform spectral analysis on the signal. Residual of the signal, returned as a column vector or a single data column timetable. residual represents the portion of the original signal X not decomposed by emd. A column vector, when X is a vector. A single data column timetable, when X is a single data column timetable. Find local maxima and minima for signal X(t) to construct an upper envelope s+(t), and a lower envelope s–(t). If ck(t) does not match the criteria of an IMF, steps 4 and 5 are skipped. The procedure is iterated again at step 1 with the new value of ck(t). Then begin from step 1, using the residual obtained as a new signal rk(t), and store ck(t) as an intrinsic mode function. For more information about the sifting process, see  and . Because the Cauchy criterion does not directly count the number of zero crossings and local extrema, it is possible that the IMFs returned by the decomposition do not satisfy the strict definition of an intrinsic mode function. In those cases, you can try reducing the value of the SiftRelativeTolerance from its default value. See  for a detailed discussion of stopping criteria. 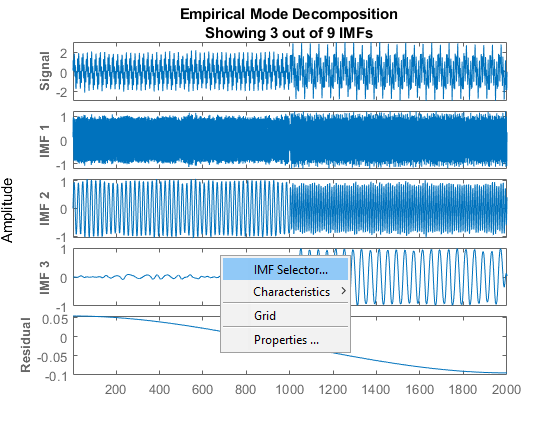 The reference also discusses the advantages and disadvantages of insisting on strictly defined IMFs in empirical mode decomposition. Huang, Norden E., Zheng Shen, Steven R. Long, Manli C. Wu, Hsing H. Shih, Quanan Zheng, Nai-Chyuan Yen, Chi Chao Tung, and Henry H. Liu. "The empirical mode decomposition and the Hilbert spectrum for nonlinear and non-stationary time series analysis." Proceedings of the Royal Society of London. Series A: Mathematical, Physical and Engineering Sciences. Vol. 454, 1998, pp. 903–995. Rilling, G., Patrick Flandrin, and Paulo Gonçalves. 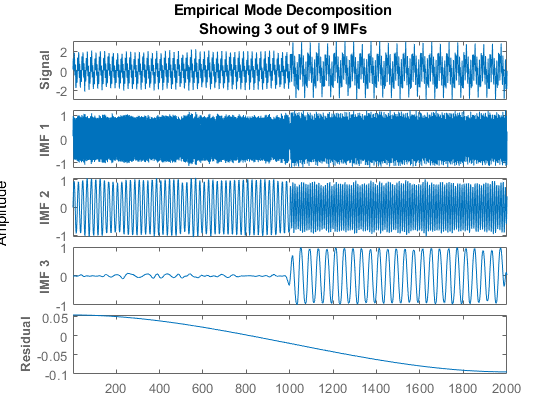 "On empirical mode decomposition and its algorithms." IEEE-EURASIP Workshop on Nonlinear Signal and Image Processing 2003. NSIP-03. Grado, Italy. 8–11. Rato, R.T., Manuel Ortigueira, and Arnaldo Batista. "On the HHT, its problems, and some solutions." Mechanical Systems and Signal Processing Vol. 22, 2008, pp. 1374–1394. Wang, Gang, Xian-Yao Chen, Fang-Li Qiao, Zhaohua Wu, and Norden Huang. "On Intrinsic Mode Function." Advances in Adaptive Data Analysis. Vol. 2, Number 3, 2010, pp. 277–293.